Point Pleasant freshman Brooke Warner (24) leads a fast break during the second half of Wednesday night’s girls basketball contest against Wahama at Gary Clark Court in Mason, W.Va.
Wahama junior Hannah Rose splits a double team during the first half of Wednesday night’s girls basketball contest against Point Pleasant at Gary Clark Court in Mason, W.Va.
MASON, W.Va. — An instant classic … all the way down to the wire. 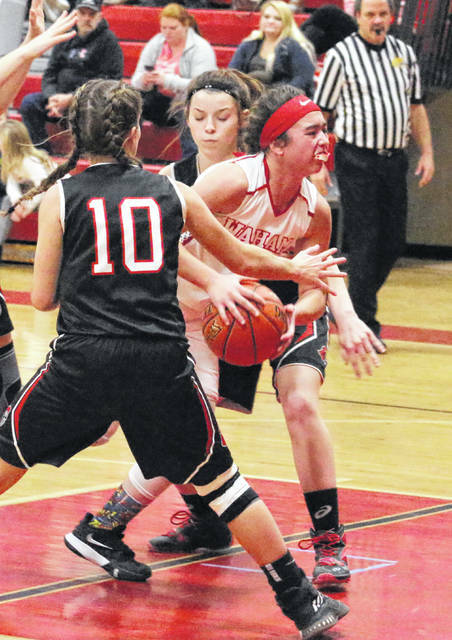 DaNayla Ward converted a layup off of a steal with seven seconds left in regulation, ultimately allowing the Point Pleasant girls basketball team to snap a six-game losing skid on Wednesday night with a hard-fought 54-52 victory over host Wahama in a non-conference matchup of Mason County teams at Gary Clark Court. There was a single tie and seven lead changes over the course of 32 minutes, and each program held a lead in each of the four periods of action. Both teams also led by as many as six points in the opening 16 minutes of play. The visiting Lady Knights (2-12) secured the largest lead of the night at 35-26 early in the third frame, but the Lady Falcons (5-7) rallied with a 15-3 surge over the final 5:15 en route to a 41-38 edge headed into the finale. Wahama took its largest lead of the night at 48-41 with 4:30 left in regulation, and that cushion managed to hold up until the final 20 seconds of play. Clinging to a 52-50 lead, Wahama surrendered a turnover that resulted in a Peyton Campbell basket that tied the game at 52-all with 17 ticks remaining. 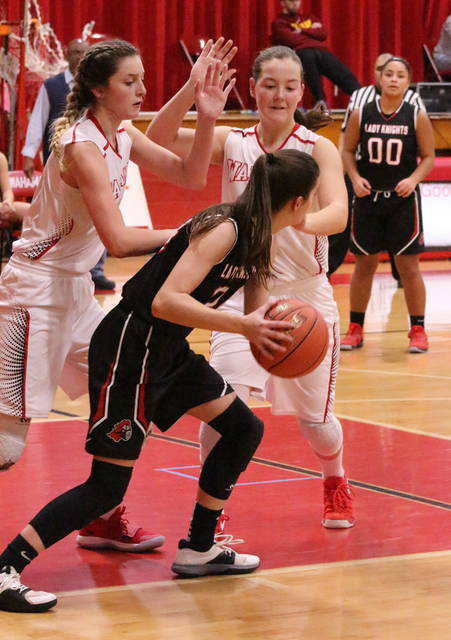 The Lady Knights secured another turnover just moments later, and Ward converted her steal into the eventual game-winner as the freshman netted a layup with seven seconds left on the clock. 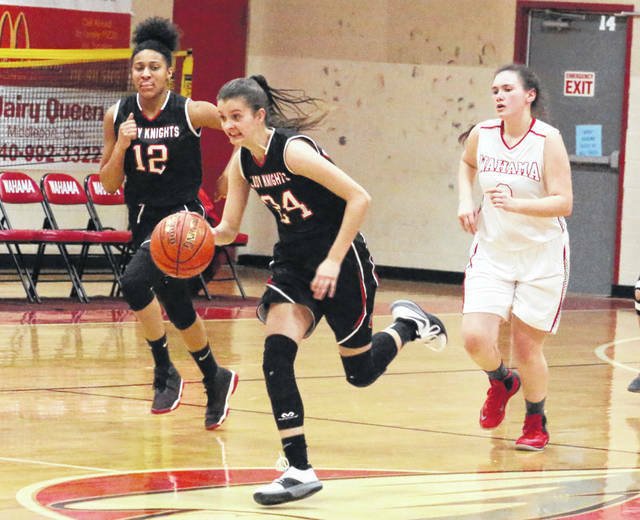 The Lady Falcons made a quick inbounds of the ball and managed an errant shot attempt before time expired, allowing the Red and Black to sneak away with the one-possession outcome. Point Pleasant is now 5-3 against the Red and White since the 2007-08 season. Wahama won last year’s outing at Point by a 67-47 margin. In a game that turned into a bit of a rollercoaster ride, PPHS coach John Fields was impressed with the way his troops battled for four quarters before finding a way to notch this victory. WHS coach John Arnott shared a similar sentiment about the contest overall, but the ending — as he noted — could have gone a little different. Point Pleasant used a pair of trifectas and hit 3-of-4 shot attempts to storm out to a quick 8-2 edge less than two minutes into play, but the hosts rallied behind six points from Hannah Rose during a 16-5 run that gave Wahama an 18-13 lead through eight minutes of play. The Red and White tacked on a free throw to extend the lead out to six, but the guests answered with a 14-7 run that resulted in a 27-26 edge at the 1:16 mark. Brooke Warner also capped a 5-0 run in the final minute with an offensive putback just before the horn, making it a 32-26 contest at the intermission. Allison Henderson nailed a trifecta out of the break and gave Point its largest lead of 35-26 at the 6:21 mark, but the Lady Falcons answered with a seven straight points to close back to within 35-33 with 3:33 remaining. Hannah Rose capped an 8-3 run over the final 2:37 that ultimately allowed WHS to take a 41-38 edge into the finale. Rose again capped a small 7-3 run with a basket at the 4:30 mark of the fourth, allowing the Lady Falcons to extend their lead out to 48-41. Henderson, however, ended a 9-2 surge with a trifecta at the 1:44 mark, giving the guests a 50-49 edge. Rose answered with two free throws for a 51-50 lead with 90 seconds left, then Torre VanMatre tacked on another free throw with 23 seconds remaining to extend the WHS lead out to 52-50. Wahama outrebounded the Lady Knights by a 46-43 overall margin, but the guests claimed a 24-20 edge on the offensive glass. WHS also committed 19 turnovers in the setback, compared to 24 miscues by Point. PPHS netted 20-of-67 field goal attempts for 30 percent, including a 6-of-22 effort from behind the arc for 27 percent. The Red and Black were also 8-of-12 at the free throw line for 67 percent. Henderson led Point Pleasant with 13 points, followed by Campbell and Warner with 11 markers apiece. Ward was next with 10 points and a game-high 15 rebounds, while Tayah Fetty and Nancy Vettese completed the winning tally with seven and two points respectively. Vettese hauled in 13 rebounds for the victors, with Fetty and Campbell each grabbing four boards. The Lady Falcons made 19-of-67 shot attempts for 28 percent, including misses on all five of their 3-point attempts. The hosts were also 14-of-25 at the charity stripe for 56 percent. 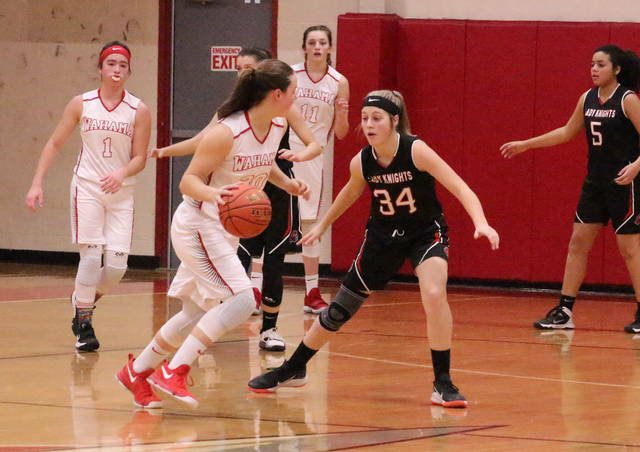 Rose paced Wahama with a game-high 21 points, followed by Emma Gibbs — who fouled out with 1:59 left in the fourth quarter — with a double-double effort of 13 points and 14 rebounds. Harley Roush was next with nine points, while Noble and VanMatre completed the scoring with respective efforts of six and three markers. VanMatre followed Gibbs with 13 rebounds, with Noble and Roush respectively hauling in seven and six caroms. Point Pleasant returns to action Friday when it hosts Lincoln County at 6:30 p.m.
Wahama hosted Eastern on Thursday night and welcomes Southern on Saturday at 2 p.m.